With the weather playing around a lot recently, trying to find somewhere to meet up with friends and young children out and about is difficult. If it’s too windy, going to Ramsgate town is a definite no-no as the winds can sometimes be a nightmare right by the Harbour, and there’s always Westwood Cross for a bit of shopping or the usual cafe or eaterie. The thing is, it’s the same for every parent whatever the age your kids are. In the summer months the opportunities are endless to entertain your kids but when the weather takes a nasty turn, unless you stay inside, the opportunities fade quickly. Last Friday Clare suggested we’d do a little different to our norm and go to the Strawberry Fields cafe in Birchington. I don’t drive (yet) so Clare picked Emily and I up and we drove the 10-15 minute drive just outside Thanet to Birchington, to the Strawberry Fields cafe. A cafe diner that is a favourite amongst a lot of people in and outside Birchington, and you can see why from the offset. The staff are incredibly friendly, very welcoming, with the biggest of smiles, ready to greet everyone who walks in. And this doesn’t stop at the door. Each and every moment, even when Emily decided she wanted to try and escape her high chair and dropped her toy for the hundredth time on the floor, the staff continued to smile, laugh and chat with everyone, including Emily. Emily, I’m convinced continued her escape plan with one waitress as her decoy. They were firm buddies by the end of our visit. We arrived just after 11am and were shown to our seat but due to a large party, we were seated on the other side of the cafe, which was a lot quieter and meant I could put a Emily into one of the high chairs, even though it took me about 20 minutes to get her in it! We decided on the afternoon tea, which meant a selection of finger sandwiches (the waitress went through a list of fillings whilst taking our order), what hot drink we wanted (tea or coffee) and what scone we preferred, whilst Clare went for one without currants I went for one with. For two people you get some delicious treats with your unlimited tea or coffee for £9pp. You get a tower of sweet treats, finger sandwiches, savoury favourites and fresh fruit and salad pieces amongst it. And of course the main attraction a scone, with a tub of clotted cream and strawberry jam in a cute little glass jar. It’s been a huge debate for as long as I can remember, that anyone who favours a cream tea will argue that the cream may go before the jam or vice versa (probably like how you pronounce it, scone like a cone?) either way, the scone was deliciously warm and crumbled in all its fluffiness in my mouth. After a few pieces of cake, a sandwich or two and some fruit, some of which sampled by Emily, I honestly was full, I think both Clare and I were and decided to explore the high street to walk off those sugar coated calories. If you plan on making a visit do, but if there are more than four of you, ring in advance and book a table as the cafe isn’t very big. Clare had called in advance and asked for our table to include two buggies, which as any mother knows can be an absolute nightmare when trying to meet friends. 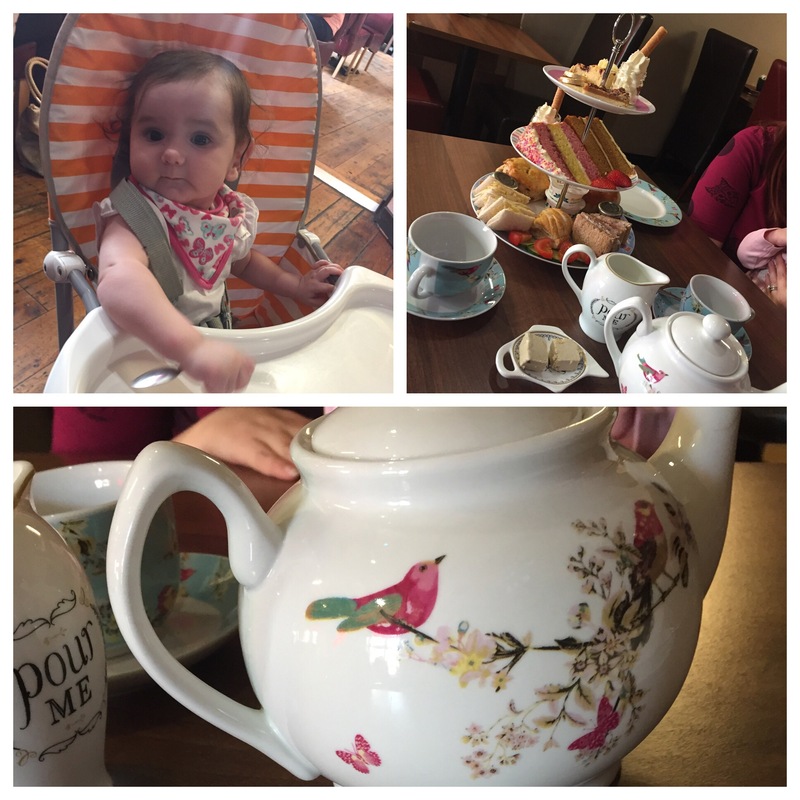 They do have high chairs available which helped with Emily when she finally got in it! Although I don’t eat anything gluten-free, I know friends who find eating out a nightmare when gluten-free isn’t an available option. But have no fear, they do have gluten-free options available and would prefer a little notice, if possible. However, according to a reviewer on TripAdvisor, it’s possible to just turn up, they might have the options readily available, but I couldn’t tell you what were though. And all you vegans out there, they will soon offer vegan cakes as well. Watch this space! There is a Pay & Display behind the cafe. Well behaved dogs are allowed but check with the owners before your visit. Do they cater for parties? Can I get anything else besides afternoon tea? Yes! They open at 8.30am and offer breakfast, sandwiches, salads, pies and more. Monday to Saturday 8.30am -5pm. Sunday closed. I really enjoyed my visit to the cafe and will definitely go again. Next time I will make sure I go on an empty stomach though!